On the banks of the Rhone river, Isere offers a sunny destination featuring lovely vineyards producing fine wines. There, hills are sloping to the west side of the Rhone producing the very famous wines of the Rhone Valley, worldwide renowned names such as Côte-Rôtie. During your camping holidays in Isère, savour some of these strong character wines. 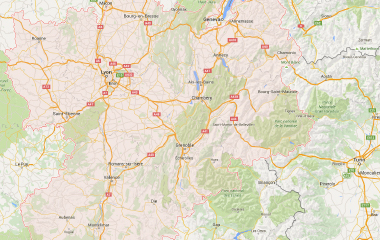 In Isere, by the river Rhone, the city of Vienne is an absolute must see, recognized for its Roman vestiges. Have a walk in the old town streets and discover historical monuments like the temple of Augustus. In july, the ancient theatre hosts the Jazz à Vienne Festival every year. In such a beautiful setting, international programming attracts all music lovers. 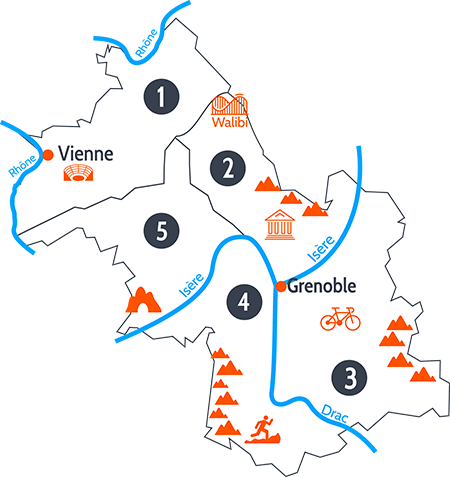 The best way to enjoy Vienne and the surroundings is to choose a campsite with swimming pool in Isère. Magnificent wooded setting, nearby Provence. 116 delineated pitches spread wide over 7,5 acres. Direct access to the river _La Varèze_. Calm and family atmosphere. Please find further details on Services & Activités. A quiet site, set in a spacious natural environment, that invites you discover its own particular way of life. LE BON TEMPS nestles in a 6 ha park, composed of over 100 rare species of vegetation. Come and discover the Zen garden, a fountain and paths set in a decorative background of ornamental ducks and pigeons.